The Disabled Ramblers is a small charity working across England and Wales to help make the countryside more accessible to people with limited mobility – which benefits everyone. 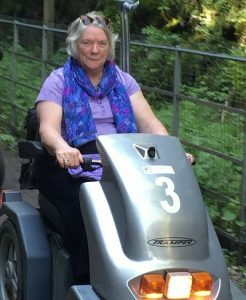 We campaign to raise awareness of the needs of people with limited mobility and organise a national programme of rambles for people who use mobility scooters. For the removal of man-made barriers such as steps, stiles, narrow gates and narrow bridges. We do not ask for tarmac everywhere. We work with national bodies including: Natural England, Natural Resources Wales, MOD, Forestry Commission, National Trails, National Parks, Areas of Outstanding Natural Beauty, British Standards Institute, National Trust, Joint Committee on Mobility for Disabled People, British Horse Society and the Ramblers. While we can offer advice, we don’t have the resources to help with individual cases. Even if you can’t ramble with us, please join and help support our work. Contact our Membership Secretary (membership@disabledramblers.co.uk) for further information. We run 25 – 30 rambles each year, organised into groups of 3 or 4 in selected areas of the country. They are run from April to October, whatever the weather. All our routes are checked well ahead, with a written Risk Assessment, and are graded from Category 1 to 3, according to difficulty. See Rambling On Wheels and Let’s Go Rambling for more information. Our rambles are supported by friends, family and volunteers. We have no paid staff so cannot offer transport to the rambles, nor can we offer personal care. If you are an able-bodied walker and would like to join us on rambles, please get in touch. Our 2018 rambles are in Sussex, the Peak District, the North York Moors, Exmoor, Northumberland & Scottish Borders, and the New Forest. Click our Calendar of Rambles for more details. Our rambles are run over a variety of terrain which means that many rambles need the use of large mobility scooters such as the Tramper and the TGA Supersport but a few rambles can be done on ‘shopping scooters’ or sturdy, off-road capable, powerchairs. If you have no suitable scooter of your own, we have four loan mobility scooters (Trampers) for hire – but only for use on our rambles by our members. or see Let’s Go Rambling for further information.